The AT-FS238 media converter is a 10/100Mbps copper to single-mode fiber media converter which can send and receive on single strand fiber (1310nm TX/1550nm RX) or (1550nm TX/1310nm RX). These units are designed to be used in pairs in a network topology to provide point-to-point access. 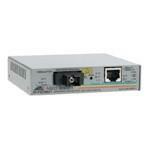 The AT-FS238 converts 10/100TX (RJ45) to 100FX (SC) and can extend distances up to 40km. Both ports feature full and half-duplex operation. The AT-FS238 is easy to install and does not require software configuration or management.